'Noah's Ark': Russia to Build World's First DNA Databank of All Living Things! Paleontologists have just discovered the world’s oldest-known petrified, fossilized sperm, according to a paper published in the latest issue of the Proceedings of the Royal Society B. “The animal that produced these giant sperm belongs to the class of Ostracoda, or mussel shrimp,” lead author Renate Matzke-Karasz, a paleontologist at the Ludwig-Maximiliian University and Geo-Bio Center, told Discovery News, explaining that these hearty animals and their relatives have been on Earth for at least 500 million years. Male mussel shrimp have industrial-strength sperm, which could explain why these animals have been around for so long. While it looks like angel hair pasta and strands are less than an inch in length, the sperm is enormous relative to the size of its male producer. During an episode of Dead Famous DNA on Channel 4 in England, Canadian dentist Dr. Michael Zuk revealed that he plans on using DNA from one of John Lennon’s teeth to make a clone baby that he can raise as his own. Zuk purchased Lennon’s molar for $33,000 when it was put up for auction about three years ago. The doctor believes that owning the tooth grants him the rights to Lennon’s DNA. He even has a plan about how to make sure the test-tube baby becomes a success. Jolie, an actress and activist, said she carries a gene, BRCA1, that increases the risk of breast and ovarian cancer. According to Jolie and a fact sheet from the Cancer Institute at Stanford Medicine, women with the BRCA1 gene have an average of a 65 percent lifetime risk for breast cancer, along with heightened risk of the cancer at an early age. Jolie is 37. Todavía no se sabe muy bien por qué, pero resulta que las pelirrojas necesitan un 20 por ciento más de anestesia que el resto de personas para que la sustancia les haga efecto cuando están sobre una mesa de operaciones. Al principio los anestesistas simplemente conocían el dato en base a sus experiencias, pero una serie de experimentos «ligeramente crueles, por el bien de la ciencia» confirmó el hecho, midiendo el dolor que sentían al recibir descargas eléctricas mientras se les suministraba gas anestesiante. In the 19th century, that view, though humorously intended, would not have been out of place among respectable thinkers. The detail of a man’s opinion might be changed by circumstances. But the idea that much of his character was ingrained at birth held no terrors. It is not, however, a view that cut much ice in 20th-century social-scientific thinking, particularly after the second world war. Those who allowed that it might have some value were generally shouted down and sometimes abused, along with all others vehemently suspected of the heresy of believing that genetic differences between individuals could have a role in shaping their behavioural differences. 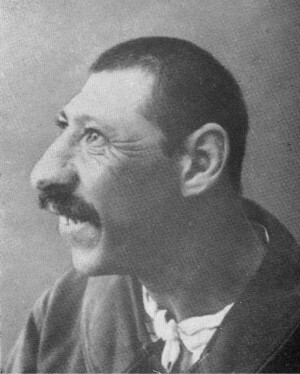 Such thinking, a product compounded of Marxism (if character really is ingrained at birth, then man might not be perfectible) and a principled rejection of the eugenics that had led, via America’s sterilisation programmes for the “feeble minded”, to the Nazi extermination camps, made life hard for those who wished to ask whether genes really do affect behaviour. Now, however, the pendulum is swinging back. In the matter of both political outlook and political participation it is coming to be seen that genes matter quite a lot. They are not the be-all and end-all. But, as a review of the field published in September in Trends in Genetics, by Peter Hatemi of Pennsylvania State University and Rose McDermott of Brown University, shows, they affect a person’s views of the world almost as much as his circumstances do, and far more than many social scientists have been willing, until recently, to admit. The evidence for this claim comes from two types of source, one relatively old and one spanking new. The old is studies of twins, comparing identical and non-identical pairs. The new is a direct examination of people’s DNA, searching for genes whose variation correlates with observable behavioural differences. Twins studies, which seek to control for the effects of upbringing by comparing identical twins (who share all their DNA) with fraternal ones (who share, on average, half), have been going on since the 1950s. In that time, quite a number, in many countries, have looked in part at political questions. Dr Hatemi and Dr McDermott pored over 89 peer-reviewed papers on the effects of genes and environment (both family upbringing and wider circumstances) on political matters. These included twins’ political knowledge, their attitudes to racial, sexual and religious questions, their views on defence and foreign policy, and their identification with particular political parties. On all counts, identical twins were found to be more alike than fraternal twins. That knowledge, refracted through the prism of statistical theory, allows calculations of the proportionate influences of genes, family environment and general environment on particular traits to be made (see chart). Some show strong genetic influence. Some show little. Intriguingly, political knowledge and party identification are at opposite ends of the spectrum. As the chart shows knowledge (or rather, presumably, an innate predisposition to acquire such knowledge) is highly genetically determined. Identification with a particular political party, by contrast, is largely a question of family upbringing—much more so than are opinions about the sorts of policy that it might be thought would determine voting patterns. But even family ties weaken when people leave home—and they do so in a way that helps disentangle genetic influence. Dr Hatemi showed this in 2009 when, along with a group of colleagues, he looked at twins aged between 11 and 75. His results demonstrated that until their late teens both kinds of twins had equally similar political views. Soon after they flew the nest, though, as might be expected, their views began to diverge. And, just as would be expected if genes have political influence, the views of fraternal twins diverged more than did those of identical ones. Between the ages of 18 and 20 identical and fraternal twins both shared nearly 70% of their political ideology. Between the ages of 21 and 25, that had shrunk to 60% for identical twins and 40% for fraternal twins. Clearly, then, genes matter. Nor do they merely affect a person’s opinions. They also affect his level of political engagement. This was shown in a study published in 2008 by James Fowler of the University of California, San Diego. Dr Fowler and his team analysed the voter-registration records of identical and fraternal twins from Los Angeles, and also from a more nationally representative database. They found that identical twins are 53% more likely either both to register or both not to register than are fraternal twins. Twins studies like these unequivocally demonstrate the heritability of politically related behaviour. What they do not do, though, is explain the underlying biology. That is an area which is only now starting to be explored. In 2010 a study published by Dr Fowler and his colleagues implicated a gene known as DRD4 in the development of political affiliation. DRD4 encodes a receptor molecule for a neurotransmitter called dopamine. (Neurotransmitters are chemicals that carry signals from one nerve cell to another.) Those with a variant of DRD4 called 7R, and also a large network of friends acquired during their adolescence, tended to be (in the American sense of the word) liberals—ie, left wing. One interesting point about this observation is that it requires both a genetic input (the 7R variant) and an environmental one (the network of friends) to take effect. DRD4-7R has previously been associated with novelty-seeking behaviour. The authors of the paper speculate that the interaction of that tendency with possible exposure to lots of different ideas held by lots of different people might push an individual in a leftwardly direction. Following up on Dr Fowler’s work, research published earlier this year by a team led by Dr Hatemi found a further 11 genes, different varieties of which might be responsible for inclining people towards liberalism or conservatism in the way that Gilbert described. These included genes involved in the regulation of three neurotransmitters—dopamine, glutamate and serotonin—and also G-protein-coupled receptors, which react to a wide variety of stimulants. Most astonishingly, the researchers found that olfactory receptors are also implicated, giving a whole, new twist to the idea that someone’s political platform “smells” wrong. The word “inclining” is important. No one is suggesting that there are particular genes, or versions of genes “for” liberalism or conservatism. But inclinations there do seem to be. 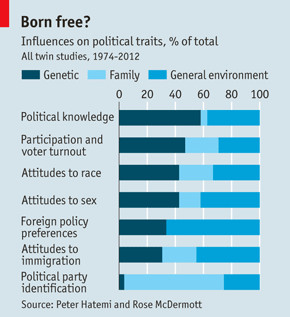 Moreover, direct studies of genes also support what the twins studies suggest about political engagement, independent of opinion. In particular, work by Dr Fowler implicates another dopamine receptor, DRD2, and also 5HTT, which regulates serotonin levels, in influencing voter turnout. 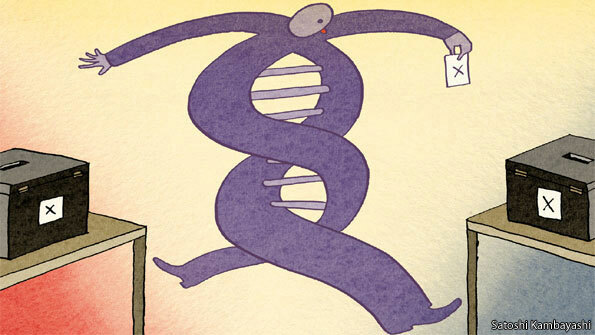 People with versions of these genes that increase the effect of the neurotransmitter are more likely to vote than those with low-activity versions. The third part of the question, though, is how this all links up with the fundamental driver of biology, evolution. The suggestion of Dr Hatemi and Dr McDermott is that political action is the collective expression of some pretty primal biological motives: those of survival and procreation. Deciding whether or not to be part of a particular group, whom else to admit to your group, how to keep or share resources, and how much sexual freedom to afford oneself, one’s neighbours and one’s children are all, and always have been, lively matters of political debate. But they are also all matters that have an impact on the crucial Darwinian business of getting genes into the next generation. Dr Hatemi and Dr McDermott are not suggesting genetic factors directly create ideologies that relate to these matters. They are suggesting, though, that genes assist in deciding which opinions an individual will find it most attractive to cleave to. Unlike the social determinists of old, however, who frequently refused to concede even the possibility of genetic influence on behaviour, the new generation of genetic political scientists are perfectly happy to acknowledge nurture along with nature. Dr Hatemi’s own work, for instance, has shown that external shocks, such as unemployment and divorce, effectively abolish the genetic influences he has detected on many ideological questions as other responses, more appropriate to survival in the changed circumstances, kick in. These responses too, of course, are probably under evolutionary—and hence genetic—control. But they are different from the ones being looked for at present. That sort of granularity, and the need to accept partial rather than universal explanations for biological phenomena, led the two researchers to one other thought. This is that part of the problem social science has had in the past in accepting biological explanations is that its practitioners do not understand the nature of the claims being made. There are, to repeat, no genes for socialism or conservatism, or for prejudice or tolerance, any more than there are genes for Christianity or Islam. But a person’s genes can sometimes propel him more easily in one direction than another. His free will is, if you like, a little freer to turn right than left, or vice versa. Gilbert was therefore not quite right. But he was not exactly wrong, either. NEW YORK — Scientists reported Sunday that they have completed a major analysis of the genetics of breast cancer, finding four major classes of the disease. They hope their work will lead to more effective treatments, perhaps with some drugs already in use. The new finding offers hints that one type of breast cancer might be vulnerable to drugs that already work against ovarian cancer. The study, published online Sunday by the journal Nature, is the latest example of research into the biological details of tumors, rather than focusing primarily on where cancer arises in the body. The hope is that such research can reveal cancer's genetic weaknesses for better drug targeting. "With this study, we're one giant step closer to understanding the genetic origins of the four major subtypes of breast cancer," Dr. Matthew Ellis of the Washington University School of Medicine said in a statement. He is a co-leader of the research. "Now we can investigate which drugs work best for patients based on the genetic profiles of their tumors," he said. 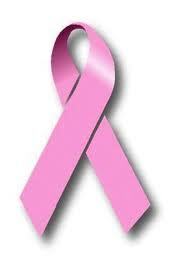 The researchers analyzed DNA of breast cancer tumors from 825 patients, looking for abnormalities. Altogether, they reported, breast cancers appear to fall into four main classes when viewed in this way. One class showed similarities to ovarian cancers, suggesting it may be driven by similar biological developments. "It's clear they are genetically more similar to ovarian tumors than to other breast cancers," Ellis said. "Whether they can be treated the same way is an intriguing possibility that needs to be explored." 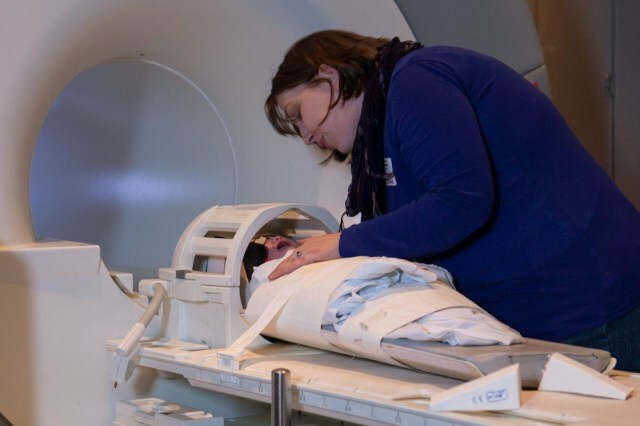 The report is the latest from the Cancer Genome Atlas, a federally funded project that has produced similar analyses for brain, colorectal, lung, and ovarian cancers. From their big toes, affection for animals, and, of course, their eyebrows, the offspring of Donor 150 were amazed to discover what they had in common both in their appearances and personalities, raising intriguing questions about our understanding of parenthood and the strange power of our genetic connections. (Eric Gay/AP) - Professor Rochelle Buffenstein holds a naked mole rat at the Barshop Institute at the UT Health Science Center in San Antonio. Growth & fabrication of replacement body parts from skin, to organs, to entire limbs. Creating microscopic "nano" robotics capable of eradicating deadly diseases, but at what electronic cost to the body? And endeavours incl. stem cell research into reversing the aging process. Where do ethics lie on in effect playing God; is the false or fabricated extension of humanity inhumane? or an inevitable rescue from the destructive human condition?